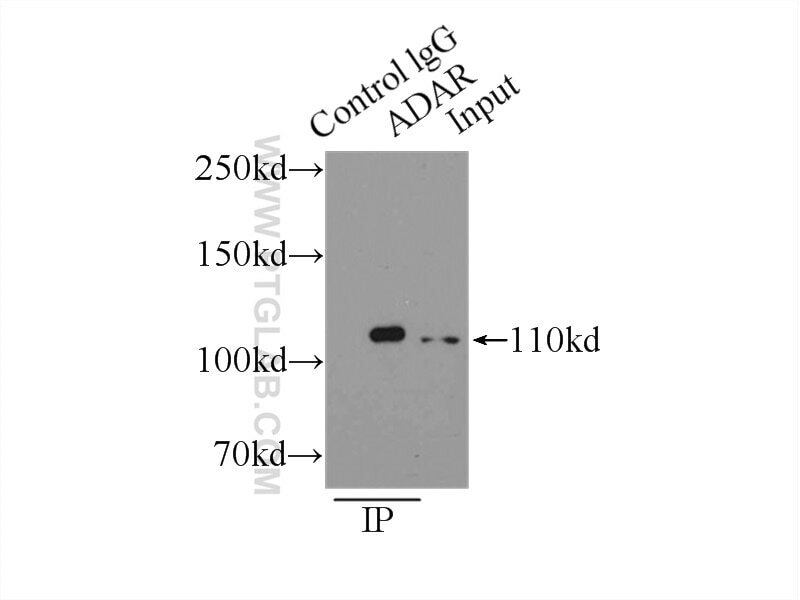 IP Result of anti-ADAR1 (IP:14330-1-AP, 4ug; Detection:14330-1-AP 1:500) with Y79 cells lysate 3000ug. 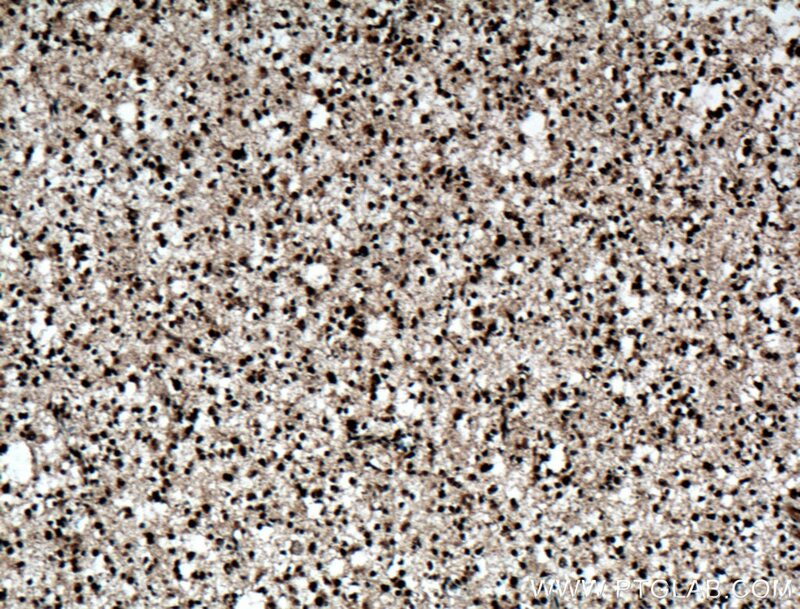 Immunohistochemical analysis of paraffin-embedded human gliomas tissue slide using 14330-1-AP( ADAR1 antibody) at dilution of 1:200 (under 10x lens) heat mediated antigen retrieved with Tris-EDTA buffer(pH9). 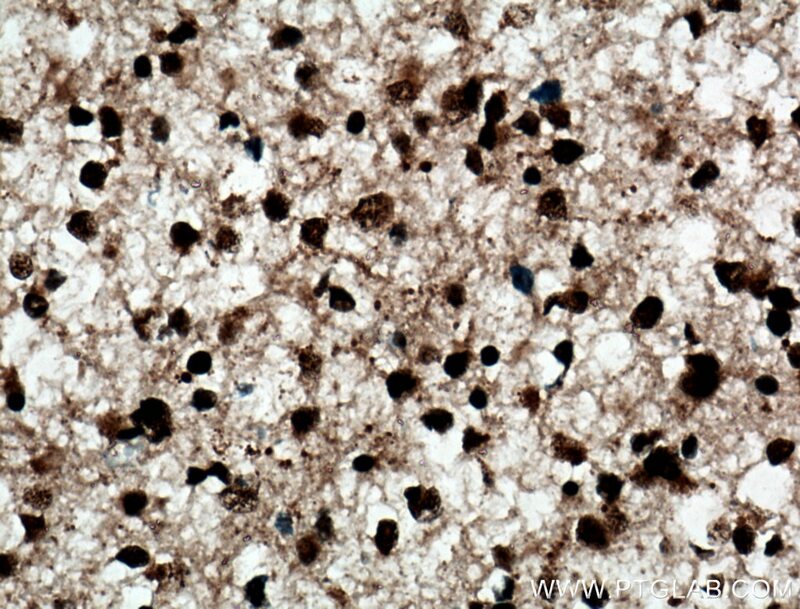 Immunohistochemical analysis of paraffin-embedded human gliomas tissue slide using 14330-1-AP( ADAR1 antibody) at dilution of 1:200 (under 40x lens) heat mediated antigen retrieved with Tris-EDTA buffer(pH9). 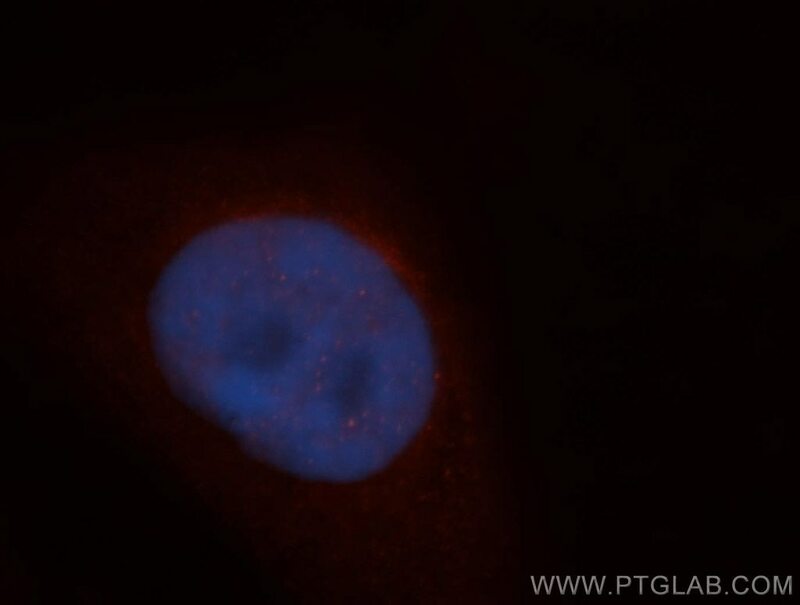 Immunofluorescent analysis of HepG2 cells, using ADAR antibody 14330-1-AP at 1:50 dilution and Rhodamine-labeled goat anti-rabbit IgG (red). Blue pseudocolor = DAPI (fluorescent DNA dye). ADAR1 is also named as ADAR1, DSRAD, G1P1, IFI4. It convert selected adenosine residues into inosine in substrate RNAs containing a relatively short dsRNA region(PMID:15556947). The human ADAR1 gene specifies two size forms of RNA-specific adenosine deaminase, an interferon (IFN) inducible ∼150 kDa protein and a constitutively expressed N-terminally truncated ∼110 kDa protein, encoded by transcripts with alternative exon 1 structures that initiate from different promoters(PMID:11111054). It has 5 isoforms produced by alternative promoter usage and alternative splicing. Defects in ADAR are a cause of dyschromatosis symmetrical hereditaria (DSH).ADAR1 can form respective homodimers, and this association is essential for its enzymatic activities(PMID:17428802). Effects of social isolation and re-socialization on cognition and ADAR1 (p110) expression in mice. 5-HT2CR antagonist/5-HT2CR inverse agonist recovered the increased isolation-induced aggressive behavior of BALB/c mice mediated by ADAR1 (p110) expression and Htr2c RNA editing.